Bakers and cake fans, sugar-crafters and dessert lovers – this post is for you. 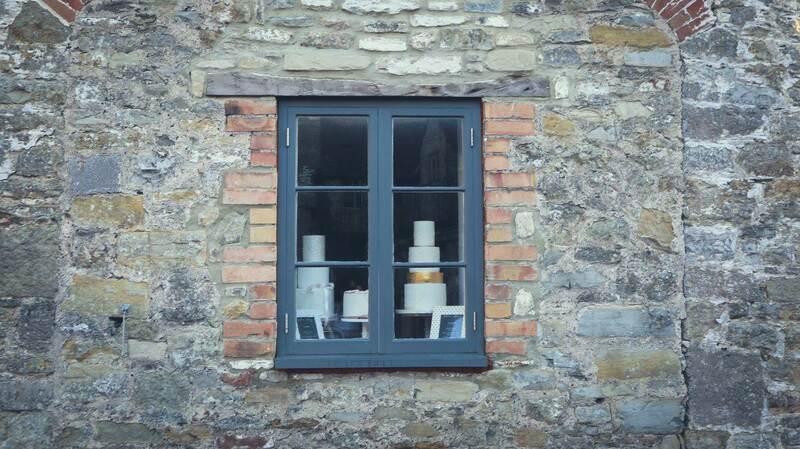 Nestled in the middle of the Somerset countryside where you’ll find historical pubs, quaint tearooms, iconic landmarks and thatched cottages, Somerset is home to some of the country’s most beautiful villages which also includes the brand spanking new Sunflower Bakery Cake Studio. Run by the lovely Kelly, who has been a professional cake artist herself since 2013, it was through Kelly’s experiences of attending cake classes across the country that a seed was planted and the idea of creating a brand new cake school in Wedmore, Somerset arrived. Parking behind the studio, grabbing ourselves a much needed coffee we were greeted by this beautiful window confirming we were most definitely in the right place. Situated in a newly renovated Grade 2 Listed Carriage Barn with clean white and pink walls, comfy chairs and high tables with a light, airy atmosphere as soon as you walk through the door you know you’re in for a treat. Girly, but modern. Fresh, but traditional, Kelly has really made this place unique and she’s achieved something us cake designers dream of. This year sees some of the UK’s most talented cake artists come to teach here and I’d booked myself on a sugar flowers class with the award-winning Dominique of Poppy Pickering Cakes. Just take a peak at the stunning cakes displayed on her website, and you’ll know exactly what I mean. They’re breathtaking. Waking up early I drove over with my lovely friend Vicky ready to learn some new techniques and skills that would hopefully expand on my already existing sugar flowers knowledge. I’m predominately self taught, having only ever taken one class back in 2013, so to say I was excited was a little bit of an understatement. The first few minutes were spent getting to know one another. With eight students from around the UK It was fantastic to be surrounded by so many like-minded people, a group of ladies who were as enthusiastic about cake decorating as I am. Dominique introduced herself and it was obvious from the outset how passionate she is about what she does. Taking our seats with the rest of class at our highly organised work stations we were immediately set to work on colouring our Squires florist paste and Dominique explained exactly how the day would run and what we’d hopefully get through. The pace was fast, but still fun. The flowers were fiddly but the instructions were easy to follow. The technique I currently use to make roses is quite time consuming and Dominique’s way of making them made so much more sense, took up far less room and was broken down in stages which will be easy to re-create at home. As we made each flower from start to finish I felt we had plenty of time to practice and get the hang of what we were doing with each petal. Dominique was great at watching us carefully and correcting when needed. With fresh coffees and a side helping of biscuits we worked away all morning stopping for lunch around 1pm which was eaten in the lovely traditional George Inn across the courtyard. A little bit of downtime is good and we all got to know each other some more by sharing our cake stories and Instagram links. Whilst we were there to learn a skill, for me, I personally loved the whole day out in general. Vicky and I laughed, joked and had lots of fun together. Freshly fed and watered we got back to business and carried on with our creations. I found that I did have to concentrate a lot and I think I’m so used to taking my own time at home that I really had to focus to stay on track and keep up. With 8 different students on one class everyone is always going to work at different paces. Some people have more experience than others but Dominique was very good at keeping everyone busy and offering help when needed, even repeating steps when required. Over the course of the day Dominique taught us everything we needed to know in order to make a pretty romantic rose, a David Austin rose, cherry blossoms, filler flowers, leaves, berries and hydrangeas. I was so pleased with the way my flowers turned out and I can’t wait to make some more this way at home. I knew I’d enjoy the day before I even arrived, but I didn’t realise how much fun I would have and I loved every single second. Whether you’re looking to kick-start your career in cake baking, or simply fancy a lovely day out, the classes here range from beginner and upwards. There really is something for every skill set. Without a doubt, unequivocally, you’ll enjoy every moment. The support from Kelly and Dominique was perfect and they were both welcoming and proudly happy to share their own experiences and techniques in a easy-going and fun way. I’ve also created a vlog of the day which you can watch on my Youtube channel here. Don’t forgot to hit that big red subscribe button too.